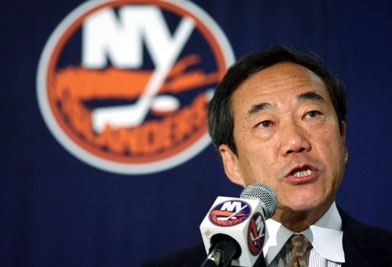 The Islanders announced yesterday that the team has been sold by Charles Wang to former Washington Capitals owner Jon Ledecky. The former owner was a minority owner in Washington DC in the late 1990’s and early 2000’s. Along with Ledecky comes London-based investor Scott Malkin. This is a huge step for this Islanders organization. Many Isles fans have hoped that a new owner would eventually buy the team and their day has finally come. With this being the last year of Islanders hockey at the Nassau Veterans Memorial Coliseum and a move to Barclays Center next season, a fresh start sounds nice. The move also opens up a potential pool of money, something that the Islanders have not seen. This could have a major effect on the roster. The team which once was struggling with money can now set out into future free agency periods and attempt to sign a top tier player. Of course, the Islanders have a few top players that are locked into longer term deals with the team. Wang will stay on to serve as majority owner for the next two seasons before stepping aside and passing the baton to Malkin and Ledecky. The sale must be approved by the league at a meeting that will take place in December.